rage quit simulator + umichan ? What caught my interest in s the ability to make custom games. Think I should give it a go for a umcc theme game? it might be something that could be interesting. (especially since I can’t get umccm to run smoothly >_>;) Reminded me of a older tabletop game for UMCC I had already started working on a while ago. here was some info from that old forum topic. I have not played much of these type games with a actual board. I remember one where you have to get to the top of a castle. Right, ultimately I don’t want to make something where you need a lot of little pieces or even a board. I would consider a board if it made sense thoguh. I saw King of Tokyo but i could not fin the camelot game. I made a example of what I had in mind so far based on what I have seen and based on my own ideas of what i had in mind. it is fairly easy and uses normal dice so far so easy to replace I guess you you can use your own dice. you basically have a character card. each player starts with X amount of randomly drawn reward cards. and can draw one during their turn. might not call them rewards cards but w/e. Any player can participate in the challenge. so of another player has 20 or more, the player with the most points will win the challenge outright. if there is a tie or multiple people complete the challenge then no popularity is given and rewards are reduced to 1.
when you win the challenge you get popularity points on the card (in blue bottom right of the card), you need X amount of those to win the game. 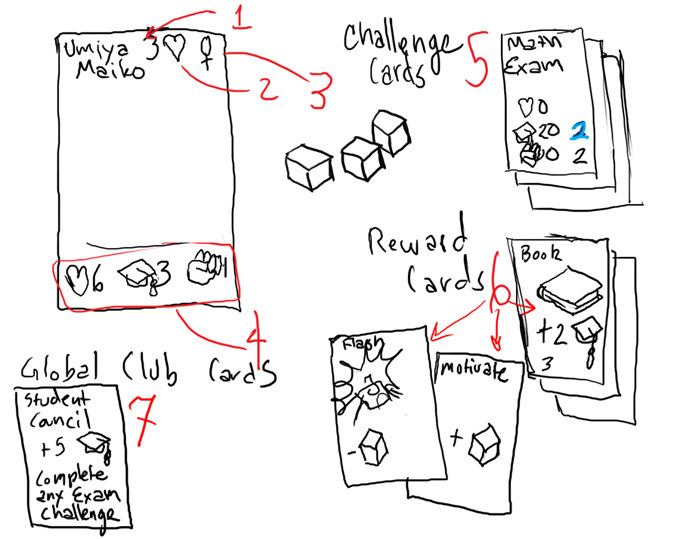 you also get reward cards that can help you win other challenges (in black). if the challenge is too tough perhaps they can be shared by players and they can agree on how to split rewards similar to munchkin. so essentially you can have for example a 2 v 2 or a free for all game. or only decide to help when it is beneficial. challenges remain in play if they are not completed on that turn. you also loose popularity if you try a challenge and fail it. only certain amount of challenges can be in play at once. if all players decide they don’t want a certain challenge in play then it can be removed. can be used at any time, some remain in play, some are single use then discarded. they help you win challenges, or help you make others loose or win challenges. for the book in the example that is a ongoing card that boost intelligence of your character by 3. flash and motivate are single use cards. flash for example will knock off a dice roll of you choice of a player. so say it was Maiko and they had 2 dice for the hear roll and 1 dice on the fist roll to complete a challenge, you can remove any of those dice before they roll. any number of character can be part of clubs, they are generally pretty safe bonus to your character and popularity. they will have requirements to join them, and some will provide bonuses like draw a extra card at the start of your turn, or stat bonuses. in the pic the club adds 5 to intelligence to any characters in the club. but say you are a intelligence character, it might provide more bonus. I was typing a ability list for the characters I think some abilities will be the same because maybe more than on player might want to have the same ability ? keep in mind these are general ideas. Man, an Eriot’s friends told me about that game on steam… i didnt realize you could use it. I think that a great idea. Not just this game, but you could come up with other neat stuff in the future. I can see many users flipping a table because there piss. But I see why it catch your interest. Because the game allows any user to create there own board game. I’ll perhaps try something a bit later then. They seem to be still doing several updates and working out kinks. So I’ll check it out later. I have plenty to do currently as is anyways heh.